Katherine demonstrating a basket handle wrap. 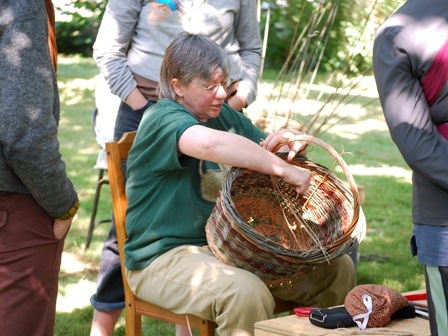 Katherine had a willow basketry class at Dunbar Gardens this past weekend. We had nine people in the class with a range of experience and age. There were total beginners, people who had made some willow baskets, a couple of handweavers, and two who had taken a previous class with Katherine but using a different technique. There was a neighbor from down the block and someone from Sebastopol, CA. Rounding out the mix were Katherine’s friends and fellow willow basket makers Alex Keggan and Debbie McLelland who came by for awhile to give the weavers some assistance when needed. The class participants had the choice of a round gathering basket or an oval garden basket depending on their experience, or not perhaps! Usually I try to get a group photo at the end of class, but somehow we didn’t get around to it. Finish times and departures varied abit at the end. So instead I put together this short slide show (hoping that nobody involved will object!). You can click on the image for a larger view of the photos. This entry was posted in basketry and tagged basketmaker, baskets, classes, Dunbar Gardens, Katherine Lewis, willow baskets by Steve@DunbarGardens. Bookmark the permalink.